I used Random.org to pick the winner of the 100th post giveaway. 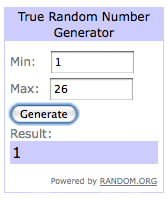 Out of 26 entries the winner was #1! The first comment on the blog! And the first commenter was Thyme2Garden! Congratulations! Thyme2Garden, please email me your mailing address and I will send out your prize. Nonetheless, I'm so excited! Thank you so much for selecting me to be your winner, even if it was random!